This Banana and Toffee pie is the easiest no-bake dessert ever. 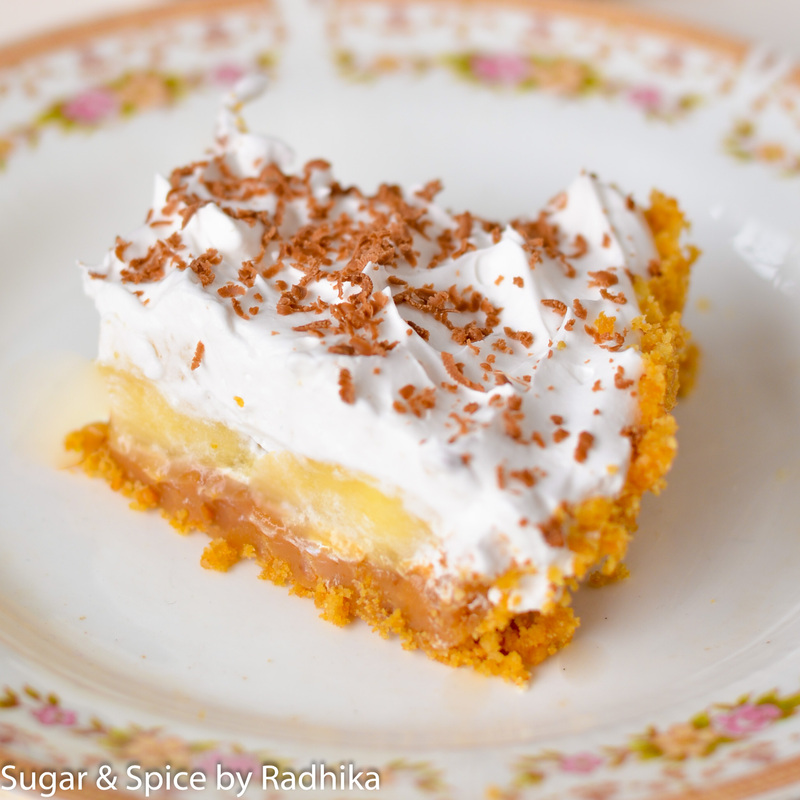 A British classic..Banoffee Pie is one of my favorite desserts! 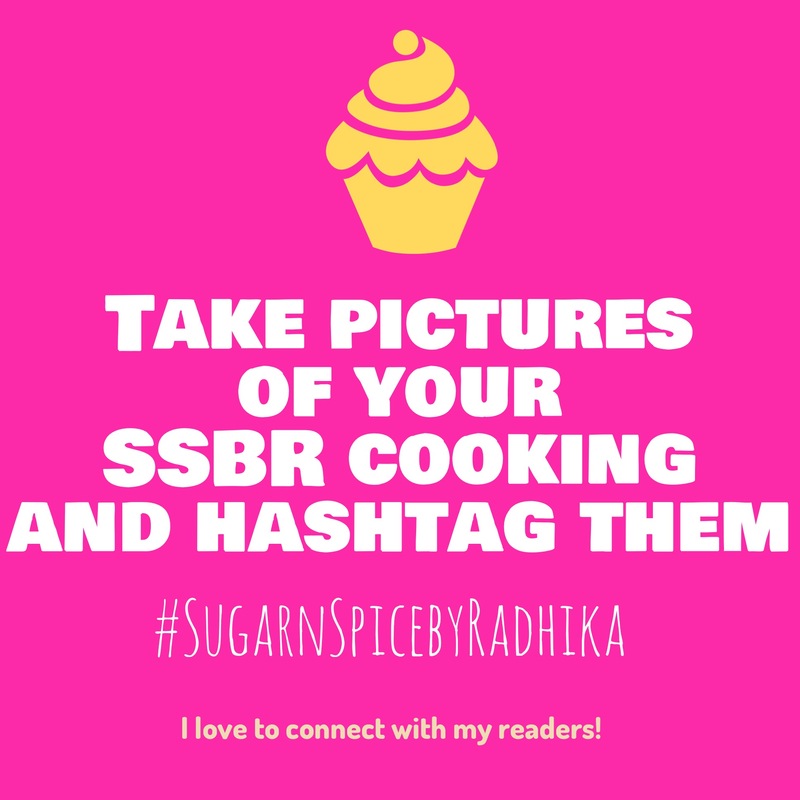 I’m starting to feel that “Sugar & Spice by Radhika” can easily qualify as a dessert blog now..2 out of 3 recipes on this blog are sweet and recently I’ve been sharing soooooo many dessert recipes in the form of muffins, cupcakes, cakes that I’m starting to feel the sugar in my system (…because I eat all this food.. 😀 I swear I do!). 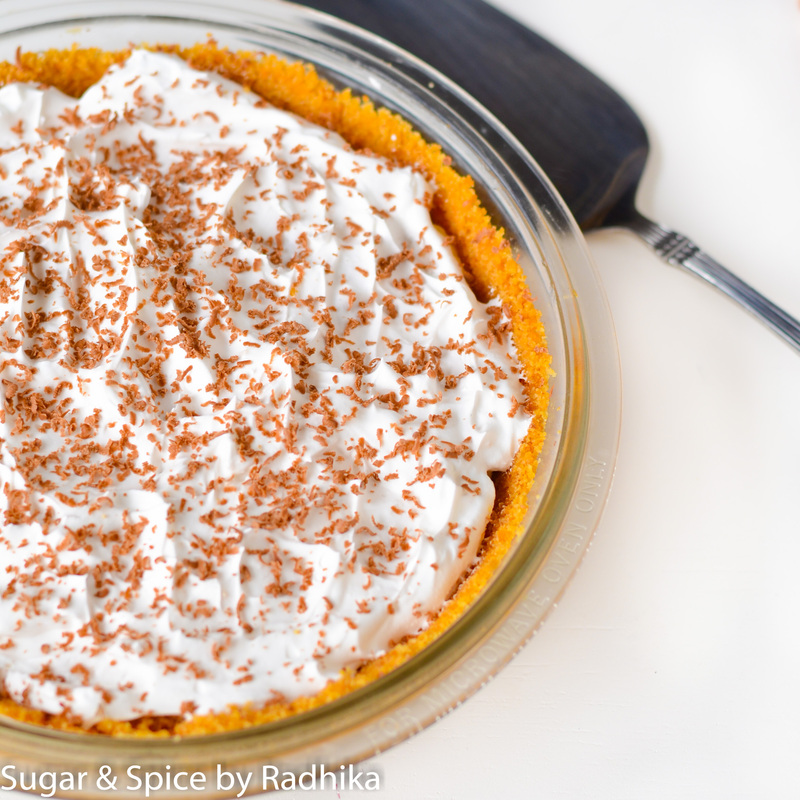 I’ve got so many reliable recipes that I make ever so often..but if you ask me if there’s any one recipe that I rely upon or use as my go-to recipe when I’m in a hurry, its this Classic Banoffee Pie recipe that I found off the internet about a year ago. Its so simple and takes around 30 minutes to make.. then you have to refrigerate it for another 30 minutes to allow the toffee to cool down and you’re set. 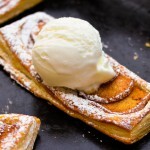 So if you have a dinner party around the corner and need a quick yet impressive dessert fix, this is it. 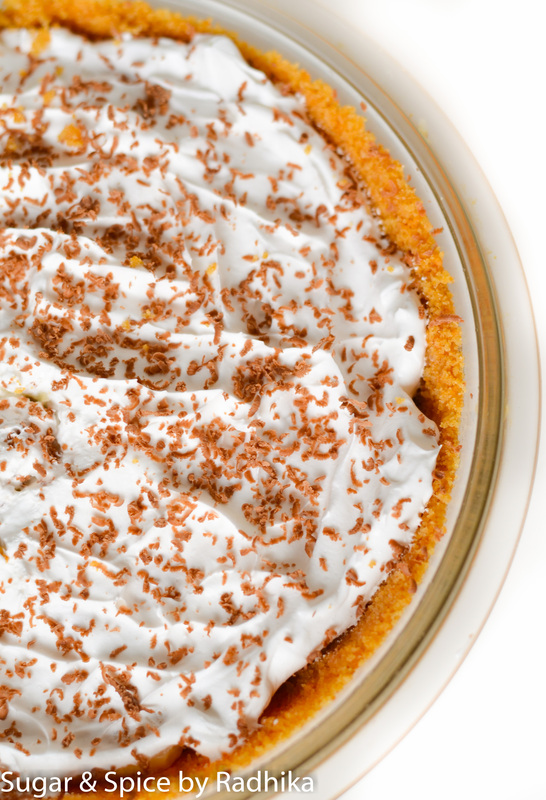 This Classic Banoffee Pie is what you need to make! This no-bake banana and toffee pie is a layered dessert with crushed biscuits on the base almost like a cheese cake.. which is followed by a layer of fudgy homemade toffee (easy to make so don’t stress). The toffee is made fresh in this recipe but if you wish and have access to canned toffee you can use that too (don’t know how well that sets though). Once the hot toffee layer cools down its basically done. All you need to do is top it with fresh bananas and whipped cream. 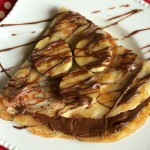 I like to sprinkle some grated chocolate on top to make it look pretty, so do that too! Crush the biscuits into a really fine powder. You could bash them in a cloth with a rolling pin or use a blender to do it for you. Once thats done, add in the melted butter to it and mix. Take your pie dish or springform tin toss this mixture into it. Now using the back of a spoon or a spatula press down the mixture and cover the base and the sides. Press well so that its nice and tight. Now freeze this for 15 minutes. Once your base has frozen transfer it to the refrigerator while you prepare the second layer, the toffee. In a pan , melt butter and sugar together until they’re combined and the sugar has melted completely. This has to be done on a LOW FLAME or the sugar will burn. Add in the condensed milk once the sugar has melted and increase the heat to high. Boil this mixture while STIRRING CONSTANTLY for about 1 1/2 to 2 minutes. Please do not forget to stir throughout this boiling process or your toffee will burn. Layer this hot toffee sauce over your base and pat it down using a spatula to form an even layer and refrigerate for 30 minutes to 1 hour. When you’re ready to serve take out the pie dish from the refrigerator and top the toffee with freshly cut bananas and freshly whipped cream (Whip your cream for good 3-5 minutes or until it forms stiff peaks). 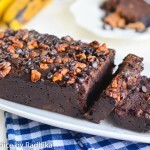 Grate some chocolate on top and serve! You can also refrigerate it for another hour for it to chill. Eat the same day or the bananas will turn brown. 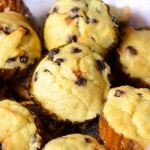 Looking for quick dessert ideas? Why don’t you try this.. This pie looks amazing to me! Those layers! 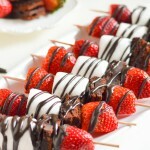 So decadent and easy to make. 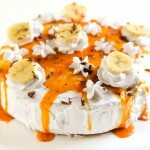 I’ve never had the pleasure of eating a banoffee pie, but feel confident it would be a hit at a summer party. Thanks for the recipe! I will let you know when I do, Radhika! Cheers! Iam using fatty dairy cream instead of rich cream, so do I need to add sugar to the cream, and if yes, how much to not make it too sweet. Hi Kaveri! Yes you’ll need to add sugar to it.. Can’t put a finger on the exact amount so start with 50grams. Although, I would suggest using whipped and not dairy cream. 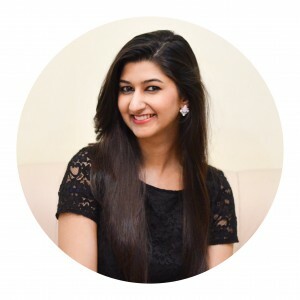 Hi Radhika! I am an absolute fan of Banoffee Pie, specially Big Chill’s. I’ve tried making it a few times at home, but I could never get the toffee/ dolce de leche right. 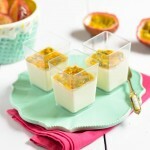 Would love to try your toffee recipe, it seems like I might get it right finally, yay! Hi Surbhi! Thank you soo much! I’m a huge fan of all big chill desserts and their banoffee is out of this world! Try this one, if you like that I’m sure you’ll like this! 🙂 Let me know when you try it!